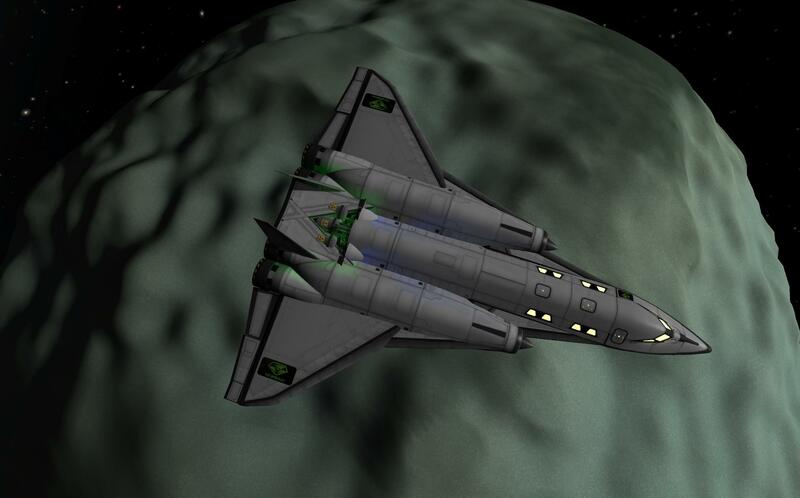 The CT-8-LR is a long range variant of the CT-8 and sister ship to the CT-4C-LR, capable of reaching LKO with ~2400m/s dV spare with a crew of 8 and set of science gear. 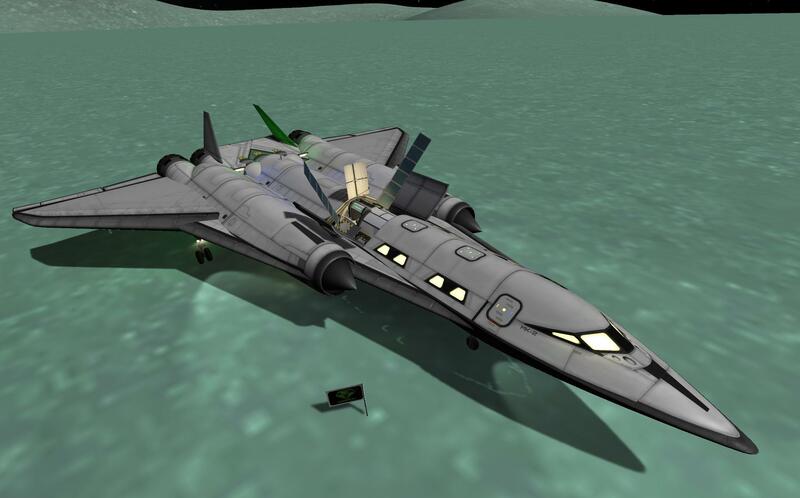 Its primary design is to run training missions to level up crew to 3 star ranking astronauts and as a general Kerbin SOI crew transporter, but it can also be used for wider missions (ie: is able to reach Duna orbit and return). The cargo has been improved and been designed to work with TAC life support. If you have TAC-LF and Configurable Containers installed the RCS tanks will be full of life support supplies and the oscarB tanks will collect waste. 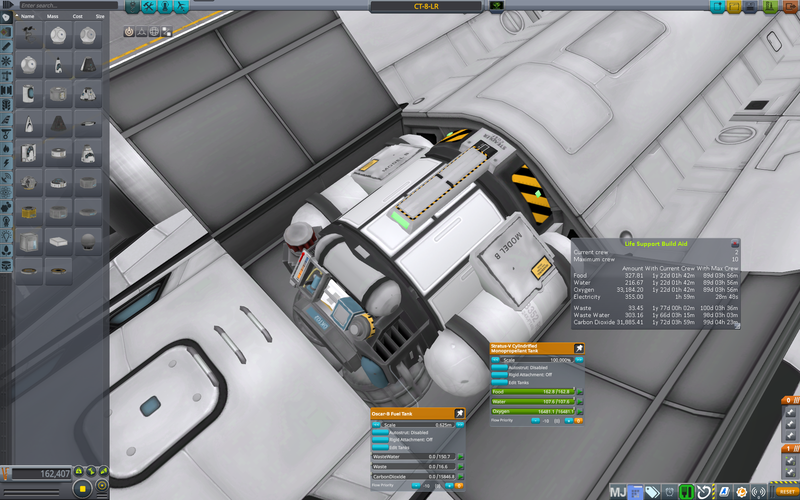 If you don’t have either mod installed the tanks will just contain their regular fuel (which you can just dump, or remove the tanks to save on weight). After take off maintain 10 degrees pitch until surface speed is 400-450m/s and the pitch up to 15 degrees. Climb at this pitch until the rate of acceleration starts to drop and switch engine mode [AG:2] and pitch up to 20 degrees. Continue at this pitch until all the oxidizer is used up, then pitch back down to 15 and fire up the nuke engines. Then gradually reduce the pitch so when the Ap reaches 70km the pitch is zero. Continue to burn to 110km and then circularize as normal. Once in LKO head for Minmus (using an efficient Hohmann transfer), should require less than 900m/s. 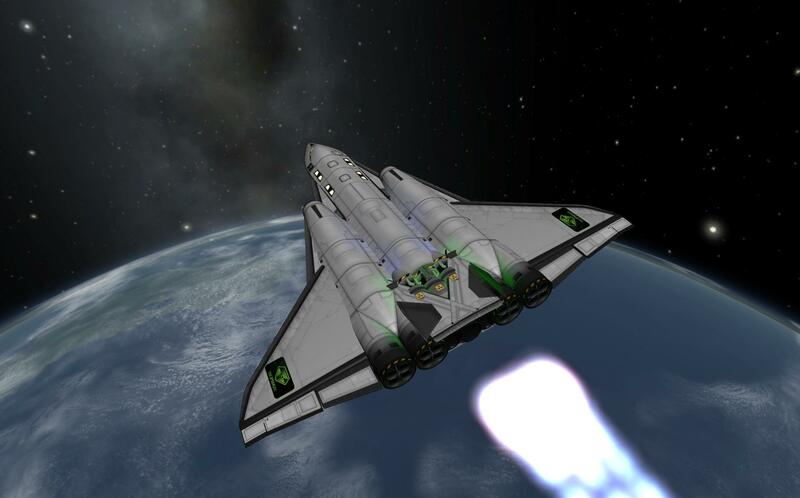 Once at Minmus deorbit and land tail first. (my prefered landing is to hover a few m above the ground and then cut engines and pitch forward to level, might bounce a bit!). 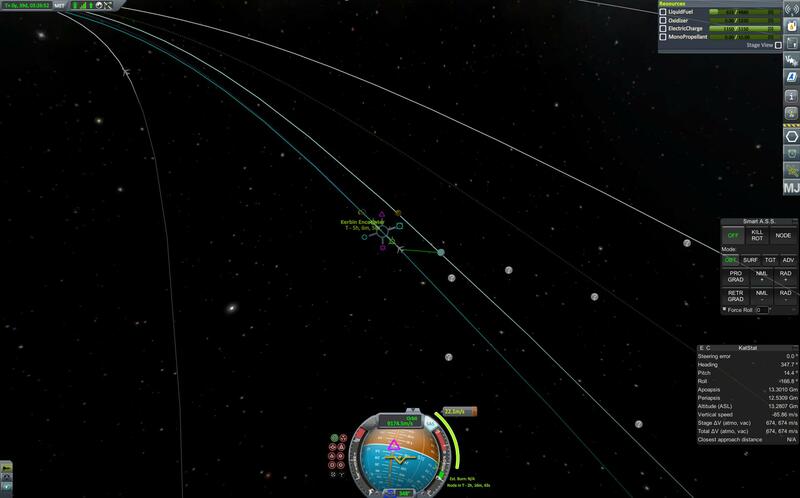 Once you leave Kerbin’s SOI set another maneuver, either radial or anti radial (again should be a very low dV burn, 20-60m/s). 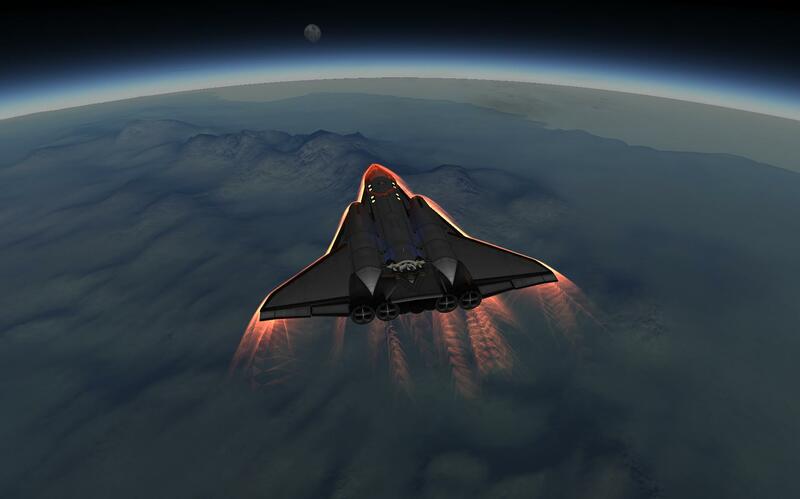 This should put you back on a Kerbin encounter with a few hours. 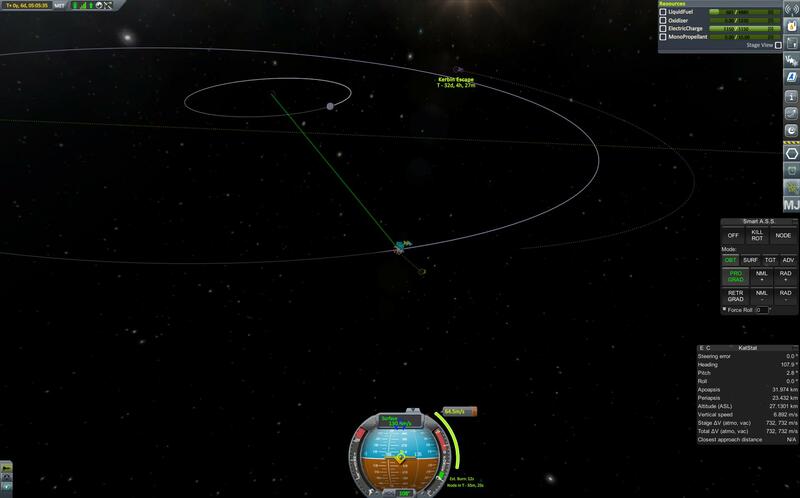 Once back in Kerbin’s SOI you’ll be on a very wide orbit that will eventually re-exit the SOI. Set Mun as your target and plot a maneuver that will bring you on a close Mun intercept. The aim is to swing around the back of Mun and use this to bring your orbit down to a much tighter elliptical orbit around Kerbin. 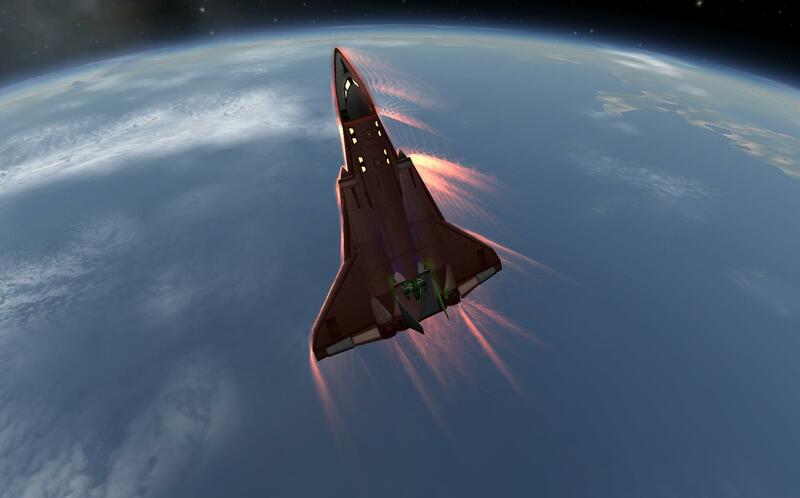 At the Pe around Mun make further adjustments to lower the Pe at Kerbin for reentry (set Pe to around 40-45km). Reentry is a little tricky. Don’t pitch up too hard once below 40km as the craft will have a tendency to flip around. Enter at a steep pitch and then bring it down to around a pitch of 20. You should still have 300-400(ish) dV spare for raising the Pe back up to a stable orbit after aerobraking and then deorbiting for return to KSC (and should still have a fair bit of fuel to run the jet engines if needed). 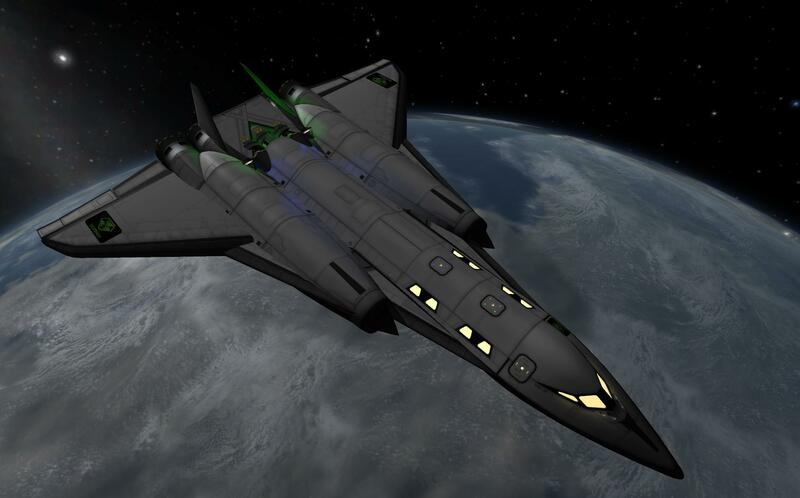 Some of pics show it with the NEBULA decal mod to add the flags to the wings but I took those off so it could be posted as a pure stock craft.